Western Storm confirmed their place at Kia Super League finals day, despite their match against arch rivals Southern Vipers being rained off in Bristol. Put into bat beneath leaden skies, Vipers advanced to 62-2 at the end of the eighth over before bad weather moved in. Following an inspection, umpires Rob White and Chris Watts adjudged the outfield too wet to permit further play and decided they had no alternative but to abandon the game. Both sides take two points, an outcome that means defending champions Storm are guaranteed a place at finals day in Hove on August 27. But a no-result was the last thing 2016 champions Vipers needed and, with two games remaining, they are now in danger of going out in the group stage. Winners and runners-up in the first two years of KSL, Vipers have met with unexpected adversity this season, winning just two of their opening seven matches. Second-from-bottom of the table and playing catch-up, the visitors desperately needed victory at the Brightside Ground if they were to keep alive their dwindling hopes of qualifying for finals day. Heavily beaten by Storm just a couple of weeks earlier, Vipers were further inconvenienced when skipper Suzie Bates lost the toss and opposite number Heather Knight inserted them. Brimful of top-order firepower, Vipers nevertheless suffered an early blow, England World Cup star Tammy Beaumont giving Freya Davies the charge and losing her off stump without scoring. But the formidable Bates and Danni Wyatt redressed the balance, finding the boundary on a regular basis as the power-play yielded 45 runs on a used pitch. The second wicket pair were moving smoothly through the gears until a rain break interrupted their concentration, Wyatt delivering a bottom-edged cut into the gloves of Rachel Priest to give Danielle Gibson a wicket upon the resumption. She had scored 27 from 20 balls with 3 fours and a six. 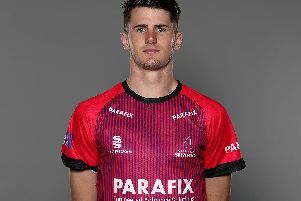 Bates picked up the cudgels thereafter, advancing to 26 not out off 24 deliveries, but returning rain forced the players off once more with the score on 62-2 at the end of the eighth over. As low cloud billowed in and conditions worsened, umpires White and Watts decided there was no further prospect of play and abandoned the match at 4.45pm.